My Whisk(e)y Of The Week: Is The Macallan's New Expression Worth $7,000? Over the years, I've written about some ridiculously expensive whiskies that also happen to be some of the greatest things to have ever caressed my taste buds. But when I rave about, say, a $60,000 collection of Balvenies or a $3,500 Port Ellen, the question inevitably arises: Is the whisky really worth that much money? Speaking as someone who gets to sample these miraculous drams for free (although, I should strenuously point out, with no strings attached from the distilleries or their PR folk), I'm not sure I'm qualified to answer. But what the hell, I'll do it anyway. 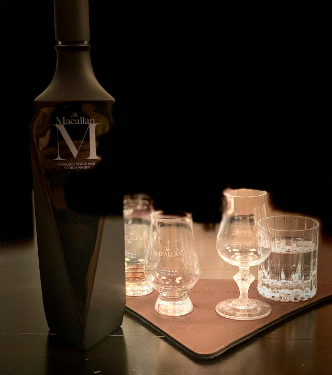 First, let's address the topic at hand, namely the Macallan's new M Black expression. Taken from six sherry casks (three 250-liter hogsheads and three 500-liter butts) and bottled at 45% ABV, it's a no-age-statement whisky, so we have no idea of its provenance. However, we do know that a portion of the blend was distilled from peated malt — something the Macallan hasn't done since the early 1950s — so it's not exactly young. Housed in a gorgeous, eye-catching Lalique black crystal decanter, it's limited to 725 bottles worldwide, a mere 40 of them available Stateside. And how does it taste? I'll tell you, it tastes pretty amazing. It starts off honey-sweet, with a luscious mouthfeel to match, before evolving into caramel and toffee notes. On the back of the palate, dry sherry combines with oak and a wisp of smoke, culminating in a long, dry, ridiculously satisfying finish. So yeah, we're talking about a really good whisky here. The only thing missing from this beauty is an age statement — something serious whisky collectors consider very important when dropping major coin on a bottle. For such sticklers, I recommend the Macallan's newest 50 Year Old bottling, laid down in 1968. A mere 200 bottles are available worldwide, priced to move at $35,000 apiece. I had the privilege to taste it as well, and it truly is extraordinary (and if you think I'm mentioning it just to brag, well... you may be right). But while we don't know the age of all the juice in M Black, we do know that a percentage of it comes from peated malt, which the Macallan hasn't used since the early '50s. There's the Lalique decanter, yours to do with as you wish after you've consumed the whisky. And then there's what I like to call the "Nyah Nyah Nyah" factor — the knowledge that only 699 other lucky stiffs on the planet will be able to own a bottle, a mere 40 of them in the States. Sometimes that knowledge alone makes spending seven grand worth it. So to get back to the question, is M Black worth the sticker price? Well, if you live high on the hog, secure in your one-percenter status, with more disposable income than you know what to do with... absolutely, go for it. The 50 Year Old is more of a status symbol, but it costs five times as much. Economically, even for the heavy of wallet, this is your better bet. But it's only worth it if you actually love and appreciate great whisky. If you're looking for an investment or a conversation piece, diamonds are forever. Whiskies are for drinking.